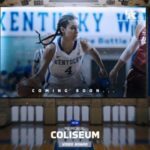 Formetco announces it recently installed indoor LED video screens at the University of Kentucky’s Memorial Coliseum, the facility where the women’s basketball, women’s volleyball and gymnastics teams compete. 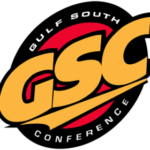 With over 18 million LEDs, the main board provides Memorial Coliseum and its fans with one of the highest resolution screens in the Southeastern Conference. 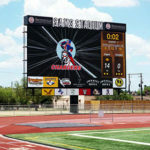 Both LED screens have a high-resolution 5.2mm pixel pitch. 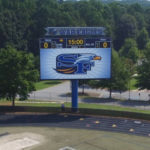 The main display is a 30-foot-tall by 60 feet wide LED video scoreboard. The other screen is 3 feet 8 inches tall and 98 feet 8 inches wide. 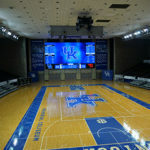 The main digital screen allows University of Kentucky fans to view live videos, live integrated scoring information, crowd interaction animations and sponsorship opportunities. 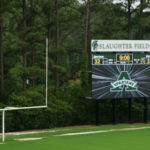 In addition, the auxiliary ribbon board provides live detailed scoring, vivid graphics, player information and sponsorship capabilities. Formetco worked closely with the University of Kentucky athletic department and the Memorial Coliseum venue staff to create a work schedule that avoided disrupting any practices or daily events. Formetco performed most of the installation work in the middle of the night. 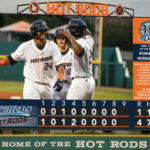 Formetco Sports, a division of Formetco, Inc. is an innovative source of product design, reliability and customized LED screen solutions for sports venues across the country. With thousands of LED installations in the U.S across multiple applications, Formetco prides itself on craftsmanship, ingenuity and expertise while maintaining the highest level of customer service in the industry.